The cost of taking a family of eight out to eat means I’ve pretty much made my peace with cooking at home, other than the occasional date night out. I’ve made it my mission to recreate my former favorite takeout dishes in a healthier, real food style. 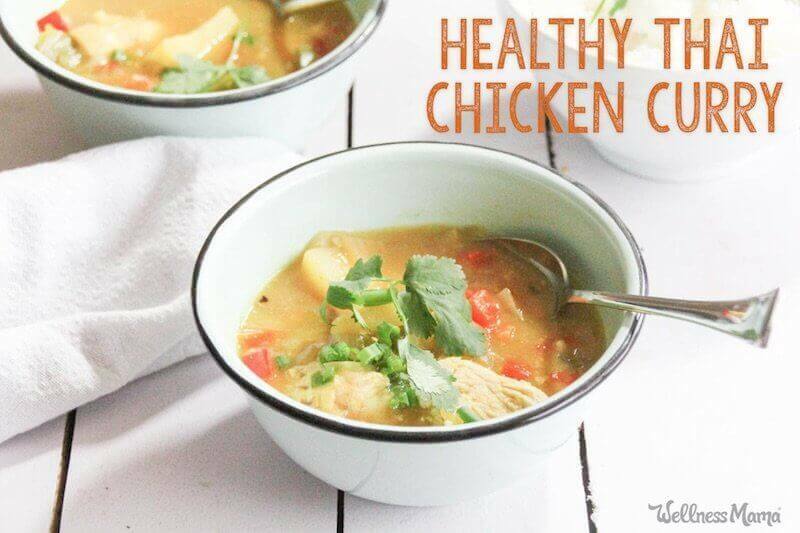 This healthy Thai chicken curry recipe is the perfect meal to spice up a weeknight! I tried curry once in my younger years and hated it, but found out later in life I just needed a less spicy version. The more I got into health after having kids, the more I learned about the benefits of using spices and herbs in cooking. I knew I had to give curry another try as it is brimming with some of the best-for-you anti-inflammatory spices: turmeric, ginger, coriander, fennel, and even cinnamon. 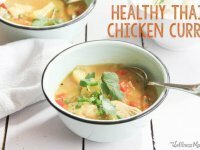 This Thai chicken curry is so easy and delicious it’s become a regular in my meal plan rotation. 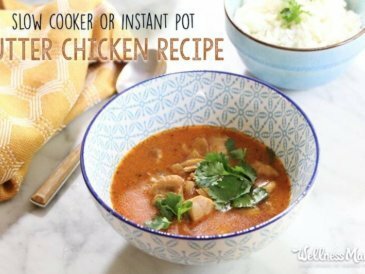 Instant Pot, Meet Thai Chicken Curry! If you have an Instant Pot, this meal takes only 30 minutes from start to finish and dirties only one pot and a cutting board! That’s exactly my kind of meal and another reason why I love my IP. Don’t be afraid … it’s simple, safe, and doesn’t have much of a learning curve if you read a few reviews to get started. Here’s a tip for making it through a busy week: batch cooking! This recipe makes it easy. On a good day to cook, double (or triple!) the ingredients and chop and prep this meal on the weekend. Just omit the coconut milk (you get a better texture when it hasn’t been frozen) and garnishes for now. Divide into two even portions and place into freezer-safe container. (If using freezer bags, be sure to lay flat.) Write the remaining ingredients to add on the label so they’re not forgotten. 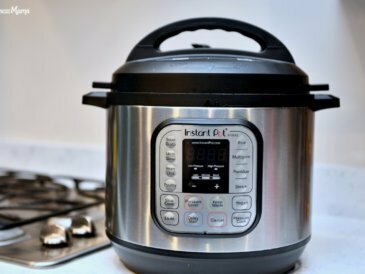 When ready to use, preheat the Instant Pot by setting it on sauté for a few minutes until the meat and vegetables begin to break apart. Add coconut milk, mix briefly, seal the lid, and proceed with cooking! Put your feet up … dinner will be ready in about 30 minutes! P.S. Don’t worry, slow cooker option in the recipe. A sweet and spicy Thai style chicken curry with coconut milk and fresh cilantro. 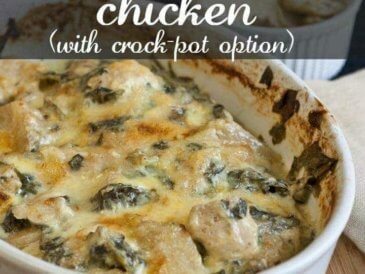 Serve with white rice or cauliflower rice. Mix all ingredients in Instant Pot except garnishes. Seal and set to high manual pressure for 15 minutes. Let pressure release naturally and serve. Top with garnishes and enjoy! 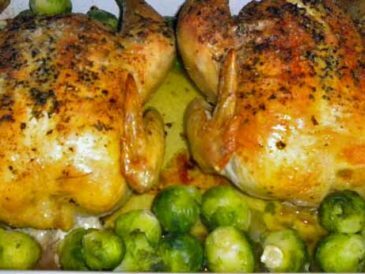 Cook for 6-8 hours on low or 4 hours on high, or until chicken is cooked through. Note: For an authentic flare, use Thai basil if you can find it! Pakistani Kima Recipe – This 30 minute, 1 pan recipe is a no fuss, but adventurous weeknight meal with ground beef, curry powder, green beans, and a touch of cinnamon. Healthy Curried Shrimp and Vegetables Recipe – The ultimate easy healthy recipe. Go from frozen to on the table with only 10 minutes prep and 15 minutes in a pan. Butter Chicken Recipe – Chicken, curry powder, garam masala, ginger, and other exotic spices made slightly sweet and creamy with a swirl of tomato paste and coconut milk. 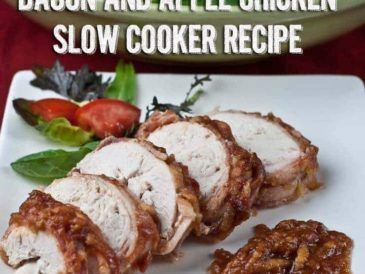 Make in slow cooker or Instant Pot for a quick and satisfying meal. Do you like the flavor of curry? What’s your favorite ethnic comfort food? Please share!